Is Heathcliff the cat’s meow for iPhone users? Do subscriptions make sense for iTunes? I scour the App Store a lot, looking for the latest and greatest applications for the iPhone and iPod touch so that I can relay their existence to you, the pressed-for-time iPhone Central reader. And—not to cast aspersions on the hard work that goes into creating these apps—some wind up on the cutting-room floor because I just can’t fathom their value to the end user. For example, just how many applications that simulate the act of passing wind does humanity actually need. Around 30, comes the reply from the development community—and their ranks are growing every day. But every now and again, an app comes along whose existence seems so inexplicable, I worry that it’s me who’s missing something here. Surely, I think to myself, there must be some widespread demand that I’m simply overlooking, some popular outcry that I just haven’t heard. Today, that app is iHeathcliff. What’s Heathcliff up to today? Find out with iHeathcliff? iHeathcliff delivers a daily comic strip to your iPhone or iPod touch featuring the side-splitting antics of America’s favorite orange cat. No, no—not that orange cat. 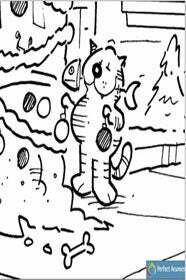 The other orange cat—the one that’s been in the funny papers since 1973. Heathcliff kind of sounds like a jerk, actually. So I implore you, gentle iPhone reader—enlighten me. What am I missing here? Did you hear that there was a way to get Heathcliff cartoons on your iPhone and think, “Oh man, at last!” Did you hear that it cost $5 and think, “$5? I would have paid $10!” Has there been a Heathcliff revival movement that I’ve just been too blind to see. “Difficult relationship?” Sounds unseemly. Perhaps there’s more of an edge to this Heathcliff strip than I remember from my innocent youth.